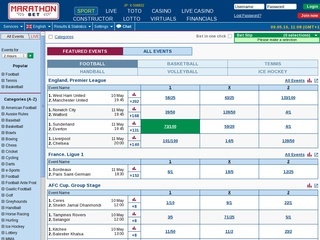 Marathonbet is another large online bookmaker that operates in various countries worldwide. The company exists since 1997 and is found by Panbet Ltd. and nowadays is one of the biggest gambling and entertainment providers with well-established name among the players. According to the latest statistics, the online bookie is serving more than 1.5 million people from 188 countries. That makes it one of the biggest and well-established names in the business. The main headquarters and offices of Marathonbet are located in the UK and more precisely in Brighton. Apart of this, the online betting company has offices in nine cities around the world and nearly 1000 employees currently active. Those people are responsible for the high quality client service, they work on the web platform etc. Marathonbet has its licence issued in Curacao and also a special AGCC Gambling licence which allows the online bookie to perform its operations on the territory of the UK and certain parts of Western Europe. It shouldn’t be a surprise that American gamblers are not allowed to wager with this bookmaker as is it the case with many other European gambling companies which also have strict policy about that issue. 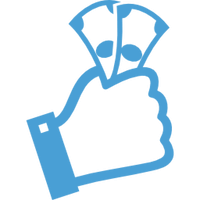 All products the online bookie offer are independently tested and their fairness and integrity have been proven many times. Marathonbet is widely popular in Russia, and it is labeled the largest betting company in the country. The betting market portion accounted to this online gambling giant grows to 50% in 2006. In addition to its strong online presence, Marathonbet has various retail stores in Belarus, Kazakhstan, Russia, England, Ukraine and Cameroon. In 2009, the people employed in Marathonbet’s physical branches were more than 3 900. The offering of the company is quite colorful and includes about 33 different sports. However, gamblers who like to wager on other markets will be disappointed. Marathonbet focuses mainly on sports betting and does not support other offerings at this time. An additional feature available for any registered client is the live betting option. Mobile users are not forgotten as well, Android devices, tablets and iOS phones are well handled by the platform. Unfortunately, live streaming is still not supported by this traditional bookmaker. When it comes to another kind of entertainment and gambling opportunities, Marathonbet is offering both live and standard casino, exciting lotto games and a unique Toto. There are more than 75 casino games, great poker tournaments and fantastic jackpots. There are also slots, 3d slots, jackpot games and many others. This online betting enterprise takes a great pride in its Toto game and offers two variations of it – Toto 1X2 and Toto Correct Score. Marathonbet provides very attractive odds in both UK and EU format. Seasoned sports betting enthusiasts will be delighted to know that the overall betting margin is calculated to 2.4%. Like many other sports betting providers, Marathonbet has a minimum of €1 on all wagers. The maximum betting value is not specified, but there is a maximum set on winnings, which is €250 000. Betting history is also available for players who like to review their gaming strategy. As almost any well-established bookmaker, Marathonbet has a well-developed football market with various opportunities for the fans of the most famous sport of all. Football Betting options range from to the standard 1X2, Correct Score, Both Teams to Score, 1st Half + Full Time, various Handicaps (including Asian) to many additional choices, such as Total Goals, Result, Corners, Cards and others. Of course, gamblers can take advantage of online betting schemes with extended complexity. System wagers and combinations are available in their standard format. Security is on a very high level when we talk about Marathonbet. The company uses SSL encryption on their servers issued and certified by Comodo CA Ltd. Clients can rest assured that all their data is protected and kept perfectly private. 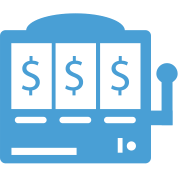 The bookie supports various contact methods and a well-trained customer care department. Every client is free to get in touch with Marathonbet’s staff by phone at or email. Take note that every email request should include your username for identification purposes. The company also supports live chatting system that can be accessed from the main menu of the website. As an overall conclusion, the bookie tries hard to deliver quality and top notch booking experience. When it comes to available payment methods for both deposits and withdraws, Marathonbet has a quite large set of payment sources. You can see them all in the table. The usual options are presented, and almost all of them are free of charge. Minimums for deposits and withdraws start from €1 and go up to €10. It’s a common practice for deposits to be instantly transferred but usually withdraws take some time to process. In most cases, cashing out completes in several hours, but it can go up to a few days for some payment methods. For all the currencies that the bookie works with, check the table. Marathonbet does not offer any promotions for new clients. VIP program is also not supported at this time. However, the online bookmaker has other various on-going bonuses and offers. From time to time, players can enjoy Free Bet type of promotion. The bonus and all its requirements will be announced upon activation. From time to time Marathonbet gives the players free bets. Also, Marathonbet offers Advancebet, which is a type of credit without any interest. Clients who have any unsettled bets and low amount of funds into their accounts can take advantage of this feature. The potential outcome of the wagers can be used again via the Advancebet panel in the user’s account. Be advised that this feature can be used to live events and events that begins in the next 48 hours. There are other some small on-going promotions on odds as well. Customers can benefit from Lucky 15, 31 & 63’s, Best Odds Guaranteed and Double Results. These minor enhancements are the surely good way for loyal players to accumulate additional funds.